If you've recently traveled down Madonna or Los Osos Valley Road, you've likely noticed the extensive road maintenance impacting those two major corridors. While the work might look like basic street resurfacing, there's actually more to it. Once the roads are paved and striped, Madonna and LOVR will don jumbo-sized bike lanes, with two to three feet of additional buffer space, which in turn will force the vehicular lanes on Madonna to narrow. "We want to make it easier to transition to protected bike lanes," said Luke Schwartz, a SLO transportation planner. "It's something we're going to be exploring in our next bike plan update." Madonna and LOVR's bike-centric reworking is a fitting symbol of the broader push by SLO to encourage and accommodate bike and pedestrian transportation over vehicular transportation in the city—a push that its leaders believe will trigger a citywide transportation "modal shift." "We're moving toward a driverless future," SLO Mayor Heidi Harmon told New Times in a recent interview. The mayor's statement is reflected in the city's policies and planning. The City Council named multi-modal transportation as a top five "major goal" in the 2015-17 budget cycle—and did so again for 2017-19. 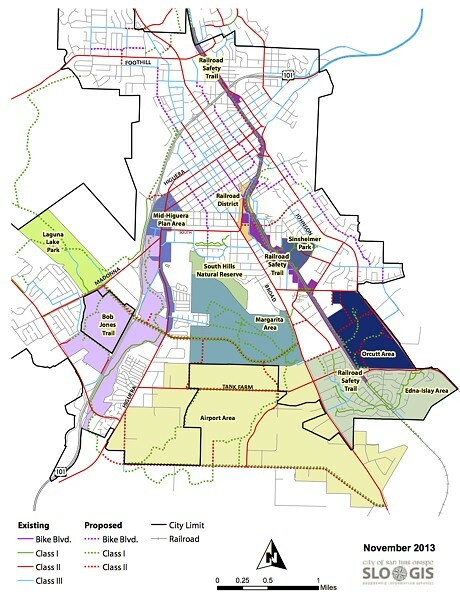 SLO has a Bike Transportation Plan, a master bicycle network vision of sorts adopted in 2013 that loosely outlines what new bike facilities are on the docket. The list is extensive. There are nearly 50 bike facility projects in the plan, ranging from protected paths to road widenings to accomodate bike lanes, to bike bridges, to roundabouts, and more. This year, the city budgeted for an update to the bike plan, which Schwartz said will end up incorporating some of the new residential development projects like San Luis Ranch and Avila Ranch, as well as sprinkle in "more innovative treatments that are now standards" for bike paths. While the bike-friendly vision is supported by some residents and city leaders like Harmon, not all of the projects have been embraced by the neighborhoods that are impacted. Look no further than the Broad Street Bike Boulevard—which plans to wipe out one side of car parking in the North Broad neighborhood to create a protected bike boulevard stretching from downtown to Foothill Boulevard—to see the bubbling concern about the vision. "I see this as an unworkable situation. We can't take any more loss of parking," said David Glidden, a Chorro Street resident who spoke against the boulevard at a City Council study session in August. "Our town cannot support what you're doing," added Madelyn Ropner, another neighboring resident. "We've got too many people trying to [drive] north and south, and we just can't accommodate changing the roads for the bicycles right now." But for SLO leaders, it's all about changing the roads for bicycles. As officials explain it, adding more bike paths and boulevards is meant to instigate a fundamental change in people's commuting habits, not to cater to the existing cycling community. "The idea of this project is not to improve conditions for folks with spandex and $4,000 bikes," Schwartz told New Times. "It's trying to attract folks with children, people who are maybe not avid cyclists, but would if they felt a little more comfortable." According to city officials, the best way to do that is to create the safest possible bike routes—protected paths ideally separated by a physical barrier. But those can also be the most intrusive types of projects to traffic circulation, according to opponents. "I'm sure the rest of the town is very much in favor of this until you put the bike lane in front of their house," explained resident Glidden. Schwartz, the SLO planner, called the Broad Street Bike Boulevard one "really important connection" between two ends of the city, but it's not the only one in the works. The Railroad Safety Trail Plan is another, aiming to provide a direct bike path from Cal Poly to downtown, alongside the Amtrak railroad. Additionally, an ambitious bike trail that would connect Foothill Boulevard with Madonna Road behind Cerro San Luis Mountain—called the Laguna Lake Bikeways—is in the plan. More bike boulevards are planned on Islay Street, Toro Street, Buckley Road, and others in town. Despite neighborhood and car commuter resistance, SLO doesn't seem to be slowing in its push for bike friendliness. In some California cities, the bike-centric paradigm shift has brought about vicious political backlash. In the Los Angeles neighborhood of Mar Vista, for example, City Councilman Mike Bonin is facing a recall campaign due to his support of narrowing Venice Boulevard to accommodate a protected bike path. But for SLO's top official, Mayor Harmon, the bike plan is a key component to achieving an even loftier goal of hers: net-zero emissions status. To hear Harmon talk about climate change and the importance of cutting out fossil fuels is to listen to someone ready for the driverless future.